609 Main is a fifty story Class A office building located on a full city block in the heart of the Houston business district. This 1,150,785 sq. ft. pre-registered LEED Platinum office structure is connected to a 633,782 sq. ft. parking garage. Camarata Masonry Systems, Ltd. (CMS) was responsible for the shop drawings, engineering and installation of 16,500 sq. ft. of honed Moca Cream interior wall cladding; 19,700 sq. ft. of honed Aurisira Limestone and honed Lasa Marble flooring / stair; 780 sq. 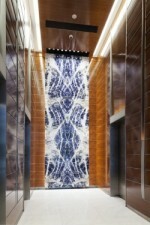 ft. of stone “paintings” comprised of Irish Green, Lapis Blue, Lasa Macchia Vecchia, Fusion Fire and Azul Macauba; 250 sq. ft. of antiqued Impala Black fountain cladding; 1,685 sq. ft. of Dal-Tile Woven Wool Solid Surface material lavatory tops and 230 sq. ft. of Ceasarstone Pure White countertops and island. In addition, CMS supplied and installed the concrete masonry units for the project. After a brief study of the contract drawings, it is easy to see that this project is all about the angles. These angles are eye-catching from the glass exterior base to the crown of the tower and throughout the interior finishes. The Architect was focused on the atypical angles and their interface with a variety of finishes. 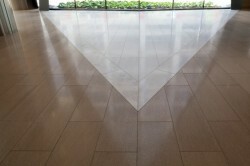 The 11’-3” arrowhead spandrel of Moca Cream that towers 20’ above the lobby floor mirrored the transition of the Aurisira Limestone and Lasa Marble paving. The sloping end condition of the 31’-6” tall Moca Cream wall, with its’ ¾” reveal at each course, had to tie in precisely with the sloping glass wall located around the corner. The attention to angles continues with the solid surface cladding and top on the security desks and the antiqued Impala Black walls that clad the 50 foot long parallelogram infinity fountain. With all the attention that the angles attract, the lobby stone “paintings” are just as prominent in appearance. These interior artwork panels are book-matched exotic stones that highlight the back walls of the elevator lobbies with their enormous size and precise layout. The stone “paintings” also serve as artwork in the meeting rooms of the Conference Center. Beyond the complex coordination and interfacing with other finishes, CMS encountered other challenges. All stone was dry laid in Italy, establishing a specific single location for each of the 7,651 pieces of stone. The project’s congested downtown location necessitated detailed sequencing and just in time delivery of the material. As the end date neared, it became necessary for CMS to break the east to west flow of the paving installation by adding extra manpower to start paving installation at the northwest portion of the lobby. With control lines in place, that were checked and rechecked, the second group of paving crews started with the intent that the paving installation meet at the centerline of the revolving door on Main Street; there was no room for error. This risky approach reduced the paving installation duration by approximately 20 days and was critical in allowing the project to achieve an on time substantial completion.